Residents of Converse Hall, a Wellness Environment building, are frustrated about various problems in their building, including reports of flooding and pests. There was water in some rooms as well as the ground floor, where dehumidifiers and fans were set up to dry the water and prevent mold growth. Recent flooding in the dorm was due to heavy rain and backed up drains. There was no email sent out the day the building flooded. 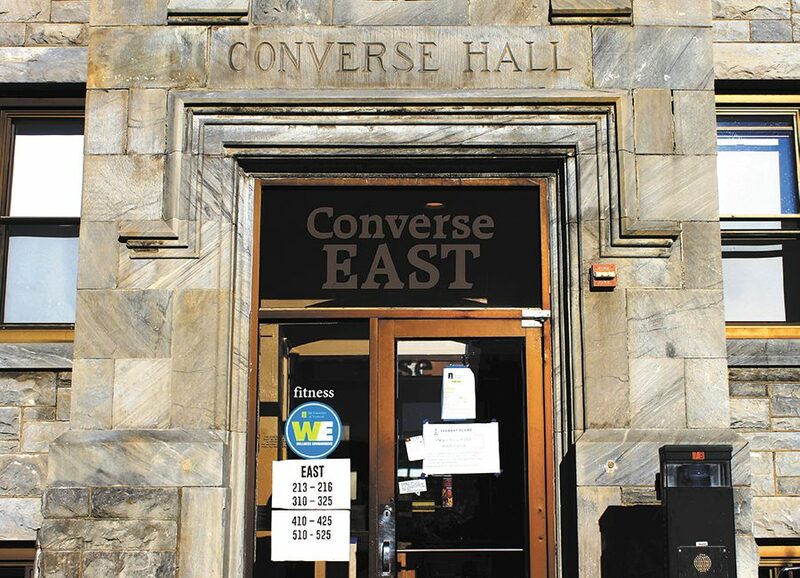 There was a stark difference between what residents anticipated when they signed up for the WE and the reality of Converse Hall, which is an old building, Residential Life Director Rafael Rodriguez said. “Most people were shocked it was happening because we were told they redid the exterior and interior,” Converse resident sophomore Nadine Marzouka said. An email was sent out Oct. 3 to the residents of Converse with the subject line: “Converse Concerns and Updates.” The email addressed bathroom issues, temperature control issues, pest control issues and water intrusion possibly affecting the asbestos in the mechanical room. There were 12 reported pest issues; eight for ants, two for mice and two for bees and wasps, according to the email. People felt like the email was just an excuse, Marzouka said. “It would have helped if they sent an update earlier about the flooding and what was going on,” Converse residential advisor Anna Vitkin, a sophomore, said. Marzouka said Converse is an old building and the issues are not as suprising because of this, but the flooding during the first week was unexpected. The flooding was caused by a drain outside. It was clogged during the Converse construction project and caused water to seep into the building, Rodriguez said. “When they were renovating Converse they put a film under the drain and they didn’t remove it when the construction was done, so because of that the drain was blocked,” Vitkin said. She became aware of the flooding when one of her residents texted her a picture of his room with water on the floor. “My residents were asking me what was going on and I wasn’t sure,” she said. There was a lot of miscommunication about the problem, Vitkin said. “We didn’t get much until way after, when there were multiple complaints,” Marzouka said. Rodriguez believes that the people most concerned by the issues in Converse Hall are first-years who did not realize how old Converse is, he said. “A lot of those individuals were able to find another community or potentially a space in CCRH,” he said. Once the flooding issue was taken care of in the Converse basement, ResLife began to outfit the space with furniture. “Out of the list of issues that were shared, I think we are able to respond to every single concern,” Rodriguez said. Every place is going to have its problems, Marzouka said, so people have to work with what they’ve got.